Thank to the peroperative endoscopy, the knowledge concerning living human matter is largely improved. A new concept based on multifibrillar inside architectures, able to respond to mechanical constraints, is proposed. But what is the mechanical comportment of this organisation, of this scaffolding when it is destroyed by a trauma? Is this architecture able to restore itself, to reniew identically? Video sequences ,made during surgical procedures show the obvious tissular differences between the scarred tissue and the normal tissue, appreciate the scarring tissue stiffness and the incapacity to re-use the initial embryologic message of construction. Inflammation, oedema, ageing, obesity also found a behavioral explanation. Nevertheless, manual therapy is certainly, at the moment, one of the best options to improve the new recovering subcutaneous and cutaneous structures and to diminish the tissular retraction and rigidity . 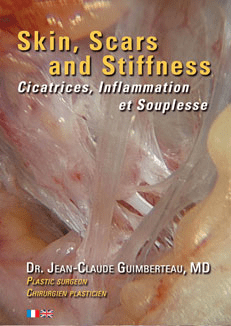 The images from these videos were taken during surgery by Dr. Jean-Claude Guimberteau. Dr. Guimberteau was born in 1947. He is co-founder and scientific director of the ” Institut Aquitain de la Main “, and Director of Research at the ” Société Française de Chirurgie Plastique Reconstructrice et Esthétique “. Member of the National Academy of Surgery, co-founder and Scientific Director of the Institute of Aquitaine hand, responsible for cell search in the French plastic surgery, reconstructive and aesthetic team.